This worksheet is used on trunk and toll cables to calculate pressure drop per foot and quickly identify the section of the cable with the leak. When used properly, it will enable you to eliminate large sections of cable and concentrate on a specific portion of the cable. Once this reduced area of search has been determined, you can use conventional leak locating tools such as the ultrasonic leak locator and/or gas detectors to identify the leak. Worksheet F is used primarily on trunk and toll cable, or any cable where pneumatic resistance is constant and there is no interlacing. If a cable changes size or gauge, the pressure drop per foot procedures explained on the worksheet will be inaccurate. Side one of Worksheet F is used to record cable pressure at each utility hole visited, pole/utility hole numbers and locations, footages between readings, and the pressure drop per foot between each location. 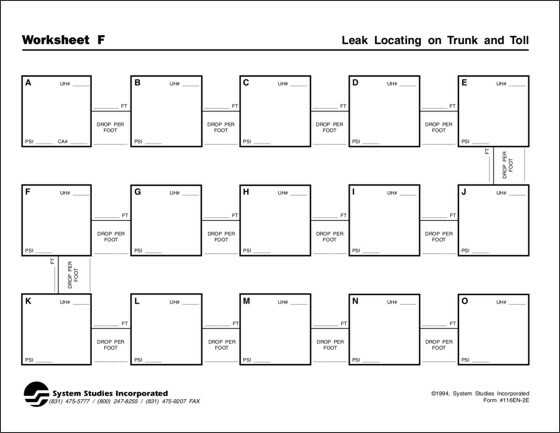 Side two consists of the specific procedures for locating a leak in trunk and toll cables. It also provides space to record the task number, cable ticket information, and the cause of the problem..